Large Enterprise « Global Market Insights, Inc.
Over the last few years, the revenue graph of OSS/BSS market has been depicting an exponential growth, on account of the surging digitization across the telecommunication, BFSI, and IT industries which have been deploying new communication technologies to accelerate the organizational workflow. The lure for inexpensive, safe, and time-saving operations has been encouraging companies to implement OSS and BSS solutions at the workspace. In addition, for empowering intelligent network management and automation, most of the industries have been giving preference for operational support services on a large scale. The noteworthy transformation across the IT, transportation, telecom, and BFSI sectors with the emergence of next-generation technologies such as blockchain, IoT (Internet of Things), and AI (artificial intelligence) will thus have a considerable impact on the OSS/BSS industry share over the years ahead. In line with the implementation of 5G networks across the telecom sector, players in the OSS/BSS market have been observing lucrative business opportunities. In fact, some telecom industries have been looking forward to strengthening their networking portfolio by automating working processes with regards to the use of 5G networks. For instance, recently, the Swedish multinational and telecommunication company, Ericsson acquired CENX to enhance its Operations Support Systems facilities. The acquisition will improve Ericsson’s service assurance and closed-loop automation capabilities which will help it to leverage network visualization and automate the telecom network to serve enterprise customers effectively. The surging use of 5G networks with the assistance of OSS for improving the connectivity in service assurance, resource-inventory management, order management, product management, customer management, network management, and revenue management will strongly fuel the OSS/BSS market size. Over the last few years, the increasing popularity of blockchain for decentralizing Network-as-a-Service (NaaS) for securing web wallets and wallet servers has also contributed toward the expansion of OSS/BSS industry. Leading technology companies have been deploying public blockchains to monetize their network resources that allow companies to analyze their operational and financial data. Considering the capability of OSS/BSS systems to secure financial data, BSFI companies have been shifting their focus toward the automation and digitization of financial processes, consequently demanding OSS/BSS technologies on a large scale. 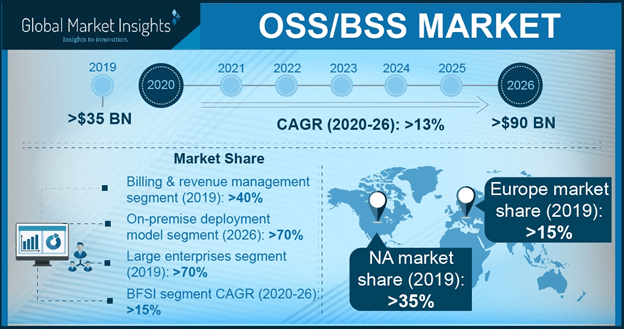 Powered by the surging adoption of modernized network security services, OSS/BSS market size from the BFSI sector will grow at an annual growth rate of more than 11% over 2018-2024. Taking into account the vast expanse of OSS/BSS market, most of the software companies have been acquiring firms involved in the development of the operational support systems environments. For instance, recently, the U.S. based leading supplier of telecommunication equipment, software, and services, Ciena acquired DonRiver which provides service inventory management software for OSS environments. This acquisition has helped Ciena improve its business process through network resource planning and utilization of closed-loop automation. The software control and programmable infrastructure of DonRiver will further optimize the Ciena’s inventory control solutions. The shifting focus of end-use sectors toward the adoption of Software as a service (SaaS) and Cloud-based digitized deployment platform for fueling the use of automation and the effective network management has been augmenting the OSS/BSS industry outlook remarkably. The integration of Machine Learning and Artificial Intelligence technologies in the network services will transform the future of OSS/BSS market with its capability to manage complex network issues and improve the customers’ experience. The transition of companies towards automated operations from traditional manual processes to improve the working efficiency and accuracy is likely to stimulate the product demand over the years ahead. Indeed, the rising concerns among financial institutions, IT and telecom companies about data security and operational breaches are poised to increase the valuation of OSS/BSS market, slated to accumulate more than USD 50 billion by the end of 2024. This entry was posted in Electronics and Media and tagged BFSI, Billing and Revenue Management, BSS, Business Support System, Cloud, Customer and Product Management, Global OSS/BSS Market, Inventory Management, IT & Telecom, Large Enterprise, Media & Entertainment, Network Management, On-Premise, Operations Support System, OSS, OSS/BSS Market, OSS/BSS Market Share, OSS/BSS Market Size, OSS/BSS Market Trends, Service Assurance, Service Fulfillment, Small & Medium Enterprise, SME.